Cédric Kipré made his debut at international level for the Ivory Coast on Tuesday, featuring in their Under 23s’ win over Togo. The Motherwell defender played the last 10 minutes in the second half of the 5-0 victory for the Elephants. Kipré has been with the Ivory Coast squad since Thursday, after travelling to their joint training camp between the full squad and Under 23s in Chantilly in France. Extended highlights from Airdrie as the Under 20s lose to Dundee in the SPFL Development League. Stephen Craigan questioned his players’ mentality as they sat 5-1 down at half time. On the back of three defeats, the Northern Irishman admitted his players looked low. But following a better second half showing, the Northern Irishman reflected on his sides 5-3 defeat against Dundee, admitting it wasn’t as negative as it may have looked. “Even though we went in at half time losing 5-1, we didn’t feel we had been totally outplayed,” the manager admitted. Motherwell Under 20s suffered their fourth defeat in a row with a 5-3 loss against Dundee in the Development League. The defeat at Excelsior Stadium marks the longest run without a win in Stephen Craigan’s reign. The Northern Irishman made two changes from the Scottish FA Youth Cup defeat against Kilmarnock on Friday, with Adam Livingstone and Dylan King dropping out. In truth, the half time scoreline of 5-1 was a bit harsh on the youngsters, who seemed to concede from every shot on goal. The scoring started in the third minute when the Dee worked the ball down their left flank before cutting back for striker Cedwyn Scott who tapped the ball home from inside the six yard box. Three minutes later, it was a carbon copy of the opener which resulted in Dundee’s second. Down the left flank again, the Tayside outfit slotted home to make it two via the foot of Scott again. But the deficit was halved by Davie Turnbull in the 12th minute, when a mix-up at the back led to goalkeeper Ferrie Calum collecting his defenders back pass. From the resulting indirect free kick, Liam Brown rolled the ball for Turnbull to fire low and hard through the crowd clustered on the goal line. Dundee bagged their third goal with their third shot on target in the 24th minute. This time, from the right side, a low cross was sent in and palmed away by Morrison. It fell kindly for Lambert, who took a touch before sliding it home. It was a case of fourth shot, fourth goal for Dundee when a cut-back found Craig Wighton eight yards out. The first-team forward took a touch before finishing high past Morrison in to the roof of the net. On the stroke of half time, Dundee broke forward and Wolters dispatched it confidently beyond Morrison. There was no hesitation at the break, when three subs were introduced for ‘Well. Luke Watt, Kyle MacDonald and Alfie Agyeman replaced Shaun Bowers, Jason Krones and Trialist. James Scott scored the goal of the game to make it 5-2. Receiving the ball with his back to goal, the striker spun past his man and finished brilliantly in to the top corner from the edge of the box. Davie Turnbull reduced the deficit to two, arriving perfectly on to a Jake Hastie cross to power a header beyond Calum, in a much better second half performance from the ‘Well, which was ultimately not enough. Eddie Wolecki Black has urged his Motherwell Ladies squad to go all out to impress during their four-week break without a competitive fixture. Following the postponement of last Sunday’s fixture with Aberdeen, Wolecki Black’s side will have had to endure a 28-day absence from action before they return to league action against Glasgow Girls on 15 April. There has been no let up on the training field for the ladies though, with extra training and gym sessions keeping up fitness levels during the lengthy spell without a game. And the ‘Well boss has been pleased with the dedication and effort from some of his squad. “The girls deserve all the support they get,” Wolecki Black said. “Currently at the club there is fantastic work going on in obtaining sponsorship for the ladies team. “I see what they all give. We’ve got four players that are mothers, they have to juggle domestic life, with football and their careers, some of their dedication is magnificent. Motherwell currently sit second in the SWPL2 table having won two of their first three league fixtures. It could have been three wins from three, had it not been for an administrative error meaning the 2-1 opening day victory over Kilmarnock was reversed to a 3-0 defeat. It was a big disappointment for the players and staff to have to endure early on in the season, but they have set their focus on using it as a catalyst to help drive them forward for the rest of the campaign. “We weren’t beaten on the pitch, we were beaten off it,” added the manager. “Throughout the situation I got great support from the club and Alan Burrows, which was a massive help to me and my staff. “After that we had to pick up the morale of the team and we did exactly that with a great win against Edinburgh University Hutchison Vale and then a strong performance against Rangers in the cup. “We’ve made things a little bit harder for ourselves but we are more than capable of making up for it. Nadir Çiftçi is the latest player in the hot seat in our Getting to Know series. The on-loan forward talks about his favourite food, who has the worst dress sense in the squad and also tries an impression of a team mate. Tickets for Motherwell’s William Hill Scottish Cup semi final with Aberdeen are now on sale. Season ticket holders and Well Society members are entitled to purchase first on an exclusive basis. Each individual can buy up to five tickets each. The ticket office and Chapman office at Fir Park will be open Monday to Friday from 9am to 5pm for ticket sales. It will also be open from 10am until kick off, and for one hour after, at the match with Rangers on Saturday, March 31. A public sale will start on Monday, April 2. The ticket office will be open on this day from 9am to 1pm. It will be open from 9am to 5pm the rest of the week and will also be open until kick off ahead of the match with Aberdeen on Tuesday, April 3. The match at Hampden Park will be played on Saturday, April 14. Kick off is at 12.15pm. Concessions are regarded as those aged under 16 and those aged 65 and over. Telephone bookings will be taken. A £1 admin charge will be applied per telephone booking. Delivery is available for any fan who cannot collect from us and who is not local. Tickets will be sent recorded delivery but the decision to have tickets posted is at the supporter’s risk and reprints will not be available. A £2.50 admin/postage charge will be added to each ticket, capped at £10. Our singing section will be in areas F2 and F3 in the east stand. Any fan requiring ambulant or wheelchair tickets should contact Brian Davidson on 07428225254 or email tickets@mfcdsa.com. The club are operating a bus from the Cooper Bar on the day of the game. The bar will be open before departure for food and drink. The bus, which will take supporters to and from Hampden Park, will cost £8. Supporters can buy by calling 01698 333333 or visiting the ticket office at Fir Park. Come and enjoy the day in style with our pre and post-match hospitality here at Fir Park. You can buy online or call to book on 01698 333333. With Trevor Carson having made his international debut this weekend, he’s joined a long list of players making their first appearances for their nation while signed with Motherwell. We’ve taken a look at a selection of those who first came to the attention of their countries while plying their trade in ML1. Having been prolific at youth level for Scotland, midfielder Lambert was afforded his first appearance for the full squad, whilst a Motherwell player, in a trip to face Japan in the Kirin Cup. The young midfielder started and played 73 minutes in the 0-0 draw in Hiroshima, before coming on as a substitute in the win over Ecuador three days later. Having then moved on a Bosman to Borussia Dortmund… and the rest is history. 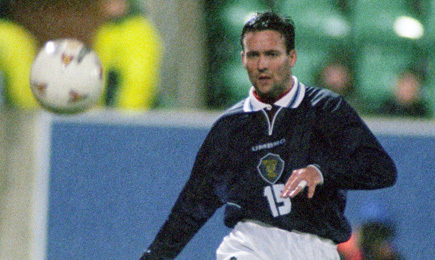 A Champions League winner just one year after leaving Fir Park, he then went on to play all three games at the 1998 World Cup and also captained his country 15 times. 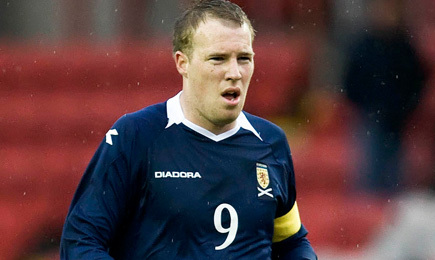 Recruited by Terry Butcher to become a regular fixture in the Steelmen’s backline between 2002 and 2005, his time at Fir Park was then capped off by a first start for his country. Having represented the nation of his father’s birth all through the youth levels, he then received full honours at the age of 26 in a friendly win over Hungary. Fearing he had been forgotten about as a prospect for Wales, a scouting trip by John Toshack to watch John Hartson at Celtic alerted the manager to Partridge, who then went on to win a total of seven caps. It would be a rare occasion to see two Motherwell players debut for Scotland in the same match but that’s exactly what happened in Prague in 2008, as George Burley took the nation away to play a friendly against Czech Republic. Clarkson, the club’s current academy coach, had the debut to remember. The then-22-year-old was thrust into the action in Prague with his side 2-0 down. Gathering a cross in the box, he skillfully engineered some space before netting to give his side hope. McCormack would then join him on the pitch as the Scots surged to equalise against the Euro 2008-bound Czechs, but they would be denied by a further goal from Libor Sionko, who settled the tie 3-1. Jamaican international Chris Humphrey could have represented Scotland because his mother was born in Kilmarnock. However, the winger was called up to play for his father’s country in 2011, at the age of 24, following two impressive seasons in claret and amber. Passport issues prevented the pacey wide-man from making his debut until a year later though, then in his third season with Motherwell. 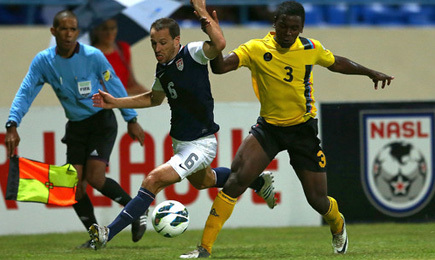 Humphrey came on at half time with Jamaica already a goal down, but the visitors held on to their slender lead. His first start came in a showdown with France, who won 8-0 thanks to goals from Antoine Griezmann, Karim Benzema, Blaise Matuidi, Yohan Cabaye and Olivier Giroud. Giovanni Trapattoni couldn’t possibly ignore the form of Darren Randolph in his time at Fir Park. The 6ft 3in stopper made his international debut in 2012, in the same year he was selected in the PFA team of the year for the first time. 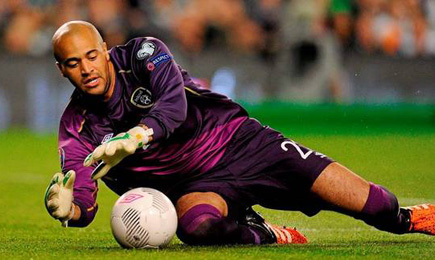 The Irishman came on as a substitute to earn his first cap in a 4-1 win over Oman on 11 September 2012. He again came on as a substitute for his country in a 2-0 defeat against Spain during the summer he was set to depart Fir Park. The keeper produced a stunning fingertip save to deny Arsenal’s Santi Cazorla, but conceded from a neat Juan Mata finish. At just 19 years of age, Francis-Angol got the nod to gain his first international cap for his country in 2012, just one year in to his spell in Lanarkshire. The London-born left back started for Antigua and Barbuda, his mother’s country of birth, as they slumped to a 3-1 defeat against Guatemala. The young defender made four appearances at international level during his four-year stint in claret and amber, which resulted in four defeats. Francis-Angol and his teammates came within seconds of drawing with the United States, but conceded in stoppage-time to lose 2-1. And not forgetting: Phil O’Donnell, James McFadden, Stephen Pearson, Steven Hammell, Brian Martin, Rob McKinnon, Steven Saunders (all Scotland), Brian McLean (Northern Ireland). Trevor Carson made his long-awaited international debut on Saturday, playing the full 90 minutes in Northern Ireland’s win over South Korea. The ‘Well goalkeeper impressed on his bow in Belfast, pulling off a number of important saves in the 2-1 win over the World Cup-bound side. “It’s all a bit of a blur,” he told BBC Northern Ireland after the match. “I sat down after the game and it all sort of hit me. “I enjoyed it. There were a couple of moments I just had to take it all in. Carson’s next opportunity to turn out for his nation will come at the end of the season, when Michael O’Neill’s side play friendlies against Panama and Costa Rica. Chris Cadden and Allan Campbell both featured for Scotland Under 21s in their 1-1 qualifying draw in Andorra. The Motherwell pair were both starters in the match for Scot Gemmill’s side, as they looked to keep themselves in contention for the 2019 UEFA European Under 21 Championships. The young Scots fell behind in the second half through an Andorran penalty, before Lewis Morgan grabbed a late leveller.